It’s that time of the year when I go on my decluttering rampage! Here’s what I have for sale this time around. US/APO shipping only, shipping included for the books / DVD. I have also come to the realization that I am never, ever going to spin. Check out the fiber pics here. I also have 2 large bags of pin-drafted merino. Make an offer for all or any of it. You pay actual cost of shipping. If you’d like to purchase anything, please email me! 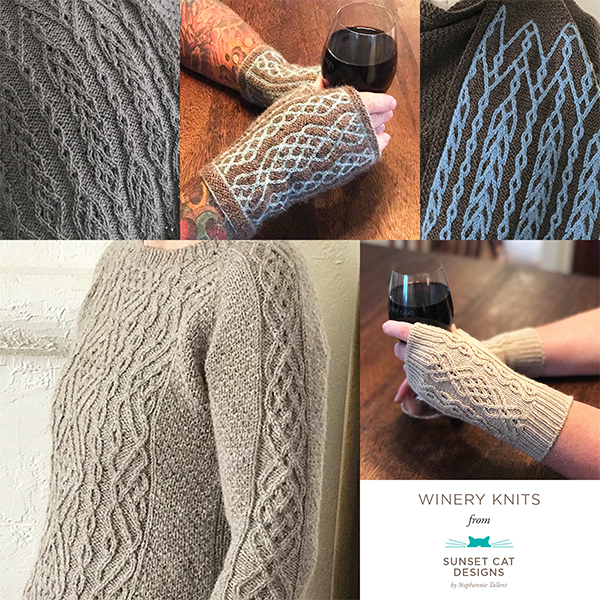 If you purchase any of these, I’ll include a copy of the Mittens! booklet (or) the Aran Lace DVD. The Wild West Collection Vol 2: Cables $19.99 (list 22.95) (I’ll gift you the PDF on Ravelry as well if you purchase one of these at this time). Only 2 left. Mittens! booklet $9.99 (list 14.95) I’ll gift you the PDF on Ravelry as well if you purchase one of these, too, at this time! Guys, this is cheaper than the PDF, and you’ll get both hardcopy & and the PDF. I need to clear these out! Aran Lace DVD $10 plus Ravelry code for one of my Aran Lace cowl patterns if you purchase it at this time (Artemisia Cowl, Achillea Cowl, Coast Oak Cowl, or Applejack Cowl). These have to go too! I still have one copy of Hitch left on Amazon. If you purchase it from me (look for me (Stephannie Tallent) as the seller, or a line in the description stating “Please message me if you’d like your copy signed. Thanks!”), I’ll gift the PDF to you on Ravelry as well. (I’m sorry, if you purchase the book(s) from someone else, or in the past, I can’t honor this.) I can easily squeeze in any of the books or the Aran Lace DVD in with this, with no additional cost in shipping.